UP AND RUNNING ALL THE TIME! 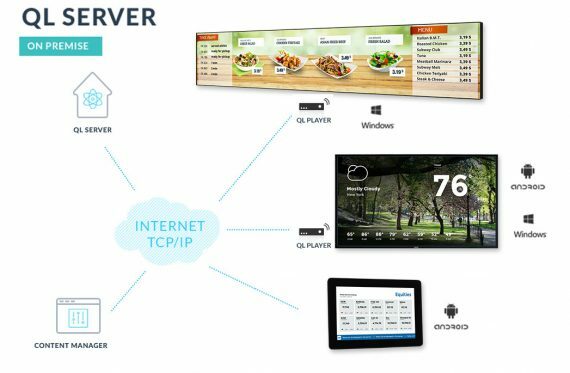 In the digital signage software industry, load balancing distributes workloads across multiple QL servers. It aims to avoid the overload of a single server resource. Using load balancing increases reliability and availability through redundancy and failover capabilities. Choosing load balancing doubles the number of concurrent players supported. Server technical profiles are measured based on Microsoft Azure offering. Operating system: Windows Server 2012. These metrics are based on Azure media storage hosted by a virtual shared drive to which all IIS servers can access to. It is intended to store content. It must be a virtual shared drive compliant with SMB 3 protocol. Note: The maximum number of players downloading simultaneously is independent from the amount of players the QL platform can effectively manage. 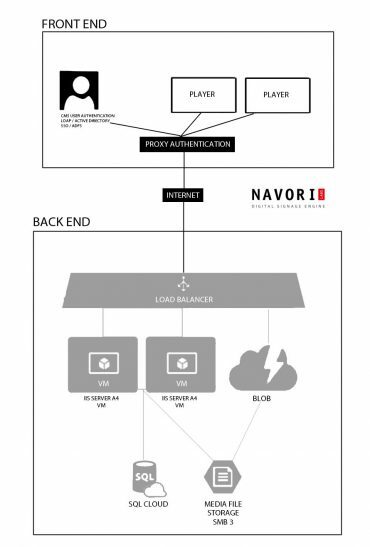 It is quite possible that a determined configuration can support up to 10 times more players than the indicated number, because generally a platform is shared by several clients who do not necessarily all download at the same time. QL player features a queuing system. If your server has to handle a higher number of downloads and reach its maximum capacity, QL software will implement a queuing system for players beyond the maximum capacity of your platform. QL Server comes with a queuing system processed sequentially.